Marriage is hard enough for the everyday civilian. But imagine marriage when you're separated by thousands of miles...when one of you daily faces the dangers of combat ...while the other shoulders all the burden of homefront duties. Add to that unpredictable schedules, frequent moves, and the challenge of reintegration, and it's no wonder military marriages are under stress. Husbands and wives in all five branches of the military need a special resource to help them navigate marriage in the midst of it all. These men and women who are giving so much for so many need a way to love one another - a way that powerfully communicates to the heart. The 5 Love Languages has a successful track record of helping military couples heal broken relationships and strengthen healthy relationships. A new chapter, "Love Language Scramblers", explains how to speak the love languages through some of the most challenging times of a military marriage. The 5 Love Languages profile will help you and your partner identify your love languages so you can put the principles to work for you immediately. 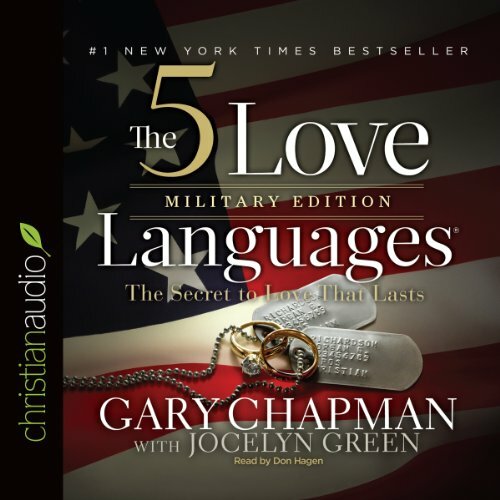 Guided by input from dozens of military couples in all stages of their careers, authors Gary Chapman and former military wife Jocelyn Green offer you an unparalleled tool for your marriage with The 5 Love Languages Military Edition. If you have any questions about this product by christianaudio.com, contact us by completing and submitting the form below. If you are looking for a specif part number, please include it with your message.